Happy Thursday! A lot of relevant literary news has been making the rounds as of late, so we thought we’d do a quick roundup to keep you up to speed. The 2014 Kundiman Book Prize, co-sponsored by Alice James Books, is still accepting manuscripts for consideration until Saturday (3/15). If you’re an Asian American poet who’s been shopping around a full-length poetry manuscript, we encourage you to submit. Past winners have included Janine Oshiro (2010; interviewed on our blog here), Matthew Olzmann (2011; interviewed here), Cathy Linh Che (2012; featured in this Q&A), and Lo Kwa Mei-en (2013). More information, including guidelines, can be found here. Earlier this year, we previewed a few books that are forthcoming in 2014, and we were recently excited to learn that Tarfia Faizullah’s Seam has now officially been released and that Kristen Eliason’s Picture Dictionary is now available for pre-order on her publisher’s website. In other contributor publication news, Craig Santos Perez’s third book, from unincorporated territory [guma’], is forthcoming from Omnidawn later this year, and Don Mee Choi’s translation of Kim Hyesoon’s Sorrowtoothpaste Mirrorcream (of which we published an excerpt in Issue 6) was launched at AWP last month. Additionally, Luisa A. Igloria, whose latest collection Henry reviewed here, recently announced that she has two more books forthcoming: Ode to the Heart Smaller than a Pencil Eraser, for which she won the May Swenson Poetry Award, and Night Willow, due out from Phoenicia Publishing (in Montreal) this spring. We were delighted to learn that four of our past contributors (Eugenia Leigh, Sally Wen Mao, Cathy Linh Che, and Michelle Chan Brown) have banded together to do a book tour this summer. Their first stop will be a launch party in NYC (at LouderARTS Bar 13), on July 14th; the remaining tour dates have not yet been announced, but you can follow their website to stay abreast of future developments. A news round-up here wouldn’t be complete without a few updates about recent developments from our colleagues at other APIA literary magazines. One thing is for sure: they’ve been busy. Last month, Kartika Review released its 2012–2013 anthology (now available for sale on Lulu). Its pages contain work by our very own Mia Ayumi Malhotra and Henry W. Leung, as well as pieces by a number of LR contributors, including Karen An-hwei Lee, Khaty Xiong, Lee Herrick, Michelle Chan Brown, Neil Aitken, Purvi Shah, R. A. Villanueva, Rachelle Cruz, and W. Todd Kaneko. The AALR also just released its newest issue, themed around the topic of “Local/Express: Asian American Arts and Community in 90s NYC” and guest edited by Curtis Chin, Terry Hong, and Parag Rajendra Khandhar. LR contributors’ work abounds in its pages, as well: R. A. Villanueva, Ocean Vuong, Purvi Shah, Eugenia Leigh, and Cathy Linh Che all have work that appears in the issue. Last, but not least, TAYO recently launched their fifth issue (which takes “Community” as its theme). They also posted this very thoughtful response to some of the reactions to their revised open submissions policy (in which they will now consider work that is not specifically themed around Filipina/o issues) on their blog. The issues that they address in their post highlight what I think is a very real dilemma for many publications serving specific communities of color: how does one navigate the balance between focusing on being a resource for those within the community while simultaneously remaining relevant within the greater literary conversation—enabling participation from and dialogue with voices from outside the community, as well? It’s a fuzzy line that’s not always easy to walk. Lantern Review is excited to be participating in a first-of-its-kind virtual reading that will take place this May, in celebration of APIA Heritage Month. Curated by Kenji C. Liu (a past LR contributor and former poetry editor of Kartika Review), the reading will feature contributors from each of several APIA literary magazines, and will take place online in real time—through Google Hangouts. The details of the event are still being worked out, but we will be sure to Tweet and Facebook updates as we know more. That’s all we have for you today, but please continue to keep us updated on relevant literary news via Facebook and Twitter so that we can share it—we love hearing what you (and the poets you admire) have been up to! Today, just in time for the start of the year of the lunar new year, we’re finishing off our two-part roundup of books that we’re looking forward to in 2014. Last week’s post (part 1) focused on recently published titles, while today’s (part 2) focuses on forthcoming books that are due out later this year. Note: the books discussed below are divided by category according to whether they are currently available for pre-order, or whether specific details of their release have, as of this posting, yet to be announced. For each category, books are listed alphabetically by author. 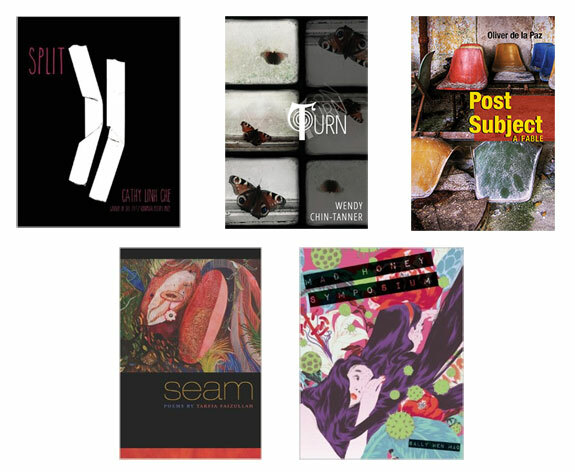 Split is the latest winner of the Kundiman Prize (the previous years’ awards having gone to Mezzanines by Matthew Olzmann and Pier by Janine Oshiro). Cathy Linh Che is a poet who writes with clarity and shattering vulnerability. I heard her read from portions of Split, which intertwines histories of personal trauma with the inherited trauma of war and displacement, at last year’s AWP, and watched the crowd be visibly moved as she began to cry on the podium. Che said recently, in a feature on the Blood-Jet Radio Hour’s blog: “at a reading, a young woman called me ‘the crying poet.’ She’d witnessed me bawling my eyes out at not one, but two of my own readings. I was a bit embarrassed by the nickname, but now it is a moniker I am proud of! If a book or reading is moving, I tear up. It is how I determine whether or not a work is good. Does it move me? And after I put down the work, does it endure?” I very much respect this: here is a poet who is willing to own the porousness between her work and herself, who is willing to allow herself to be moved by both the process and the “read” experience of her own writing. I can’t wait to read Split. This is a special one for us here at LR. Wendy has been our staff interviewer for the past three seasons (she’s the one who’s been responsible for bringing you the insights of everyone from Garrett Hongo to Don Mee Choi), and we are so very ecstatic that she has a book forthcoming! We first got to know Wendy through her sonically rich, smart, politically-attuned poetry—we published a piece of hers in Issue 3 and enjoyed it so much that we made it the “closer” for the main body of the issue. Since joining the blog staff, she’s been a huge asset to the team, contributing colorful and extremely thoughtful interviews each month. We were thrilled when we learned that Sibling Rivalry had picked up her book, and are very much looking forward to reading it in a couple of months’ time. In his review of Bao Phi’s book, which we posted yesterday, guest contributor Greg Choy made some particularly intriguing observations about shifting trends in Asian American poetry, especially with regards to its relationship with community-based activism. The discussion about how best to engage with politics (and specifically, about whether to engage with identitarian politics) in our work is broad and ongoing, and in light of that, I thought I would follow up on Prof. Choy’s thoughts by pointing you towards a few insightful write-ups that provide additional perspectives on the matter. I appreciate the thoughtful dialogue to be had in this article with regard to Asian American poetry’s stylistic diversity, its audiences, its status both inside and outside of academia, and its current relationship to its activist roots. In particular, I think Tim Yu makes a spot-on observation that while, in the wave that immediately followed the 70’s, poets were more interested in the confessional mode than in political rhetoric, poets are now coming back towards the political, some through the overt expression of activist “creeds,” as is true in the spoken word scene, and others more quietly, by infusing their approaches to craft and subject matter with strong political undertones (Yu points to Ken Chen as an example of one such poet). “We’ve had two decades of Li-Young Lee and Marilyn Chin and these writers who really risk prominence writing about their own personal experience,” he says, but “that’s not where we are anymore.” His claim is exemplified by the list of recommended titles the editors provide at the end of the article: from Cathy Park Hong to Barbara Jane Reyes to Ronaldo V. Wilson, the body of contemporary Asian American poets who are again engaging with the political (particularly through experimental forms) is strong, and seems to be growing. It’s hard to believe that a year has gone by since last year’s AWP Conference in Denver, but the months have indeed flown and—it’s that time again! The editors of LR have assembled a list of panels and readings we thought might be interest to readers and writers of Asian American poetry. Keep an eye out for us in particular at Kundiman’s panel on Friday at noon — we’ll have promotional materials and information about our off-site reading, scheduled for Friday night at 7:30 PM. If you’re browsing the bookfair, you’ll also be able to find our materials at the Boxcar Poetry Review table. These poets are part of a project called PUP, “Poets in Unexpected Places” or “Pop-Up Poets.” They do exactly what their name implies: pop up in unexpected public locations (like the subway, the Botanic Gardens, a supermarket) to read poetry. You can read about some of their experiences on their blog, in which they detail stories of people’s reactions to their performances. My favorite, I think, is their most recent post about a Q-train ride in which one of the riders got up and started dancing, while the rest of the car clapped and cheered! Such unexpected joy in the middle of a city that is known for its public mask of anonymity (the summer that I worked in Manhattan, we were distinctly advised by our HR trainers to put on a confident, stand-offish “subway face” while riding public transit in order to avoid sticking out). I love the idea of bringing poetry to public spaces at unexpected times, of incorporating it into the everyday rhythms of life in playful and soul-filled ways. PUP thrives on the idea that poetry is (and may at any time) be all around us, and that its wild spontaneity and beauty is something to be celebrated, all day, every day. I love the idea of bringing PUP-style projects to other parts of the nation, too. Watching the video got me all revved up imagining what it would be like to have a PUP style group in quiet little South Bend, IN, or in my parents’ tiny hometown in NJ—wouldn’t it be cool if poets popped up in the middle of a bank lobby, or on the South Shore line or Riverline, or in front of the public library, or in the middle of a mall or a cafe or bar? Or even in the grocery lines at Costco or Meijer? Or in the different departments? You could have poets in all the aisles! Have you ever participated in a guerilla-style poetry project? If so, please do share your experience with us; we’d love to hear your stories! 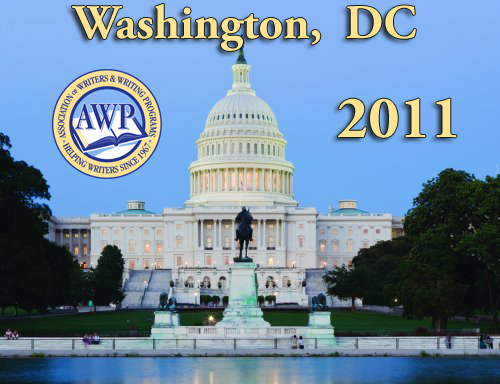 As we mentioned last week, the LR editors are gearing up for the 2010 AWP Conference with great excitement. For those of you who will also be going, we thought we’d put together a list of panels and readings that we thought might be of special interest to readers and writers of Asian American poetry. Come look for us, in particular, at Kundiman’s Thursday panel and Wednesday off-site reading (co-sponsored with Cave Canem). If you check out the bookfair, you’ll also be able to find us (and our materials) at the Kundiman/Alice James Books table. Cost: No charge for the event. Please join Ahsahta Press and Omnidawn Publishing for a reading. The readers will be: Christopher Arigo, Susan Briante, Dan Beachy-Quick, Maxine Chernoff & Paul Hoover, Gillian Conoley, Ben Doller, Lisa Fishman, Noah Eli Gordon, Richard Greenfield, Janet Holmes, Hank Lazer, Laura Moriarty, Rusty Morrison, G.E. Patterson, Craig Santos Perez, Bin Ramke, Don Revell, Elizabeth Robinson, Heather Sellers, Heidi Lynn Staples, Michelle Taransky. Join the Cave Canem & Kundiman Families for a Reading Featuring Toi Derricotte, Sarah Gambito, Cornelius Eady, Oliver de la Paz, Dawn Lundy Martin & Kazim Ali + a salon featuring Cave Canem and Kundiman fellows & family (bring a poem to share!) Emceed by Ching-In Chen & Tara Betts. The presenting of poetry in beautifully laid-out flat prints — often accompanied with artwork or produced using the letterpress process — is a time-honored tradition. The broadside emphasizes the way that a poem navigates visual space and draws out the reader’s sensual experience of a poem beyond the metaphorical or imagined and into the realm of physical touch, color, line, and shape. The production of broadsides also provides opportunities for collaborative conversation between poets and the people who deal intimately with the physical production and setting of their work: book artists/printers, painters and illustrators. In recent years (especially with the advent of internet technology), the broadside also has taken on new importance as a means by which to make poetry more familiar, more affordable, and more culturally accessible to the public. 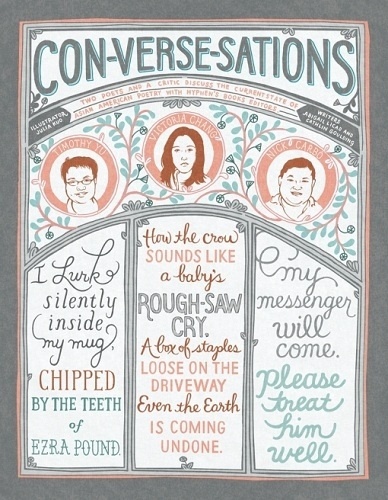 The Poetry Foundation’s free downloadable “refrigerator” broadsides and the Broadsided project — which publishes printable electronic broadsides and encourages their free distribution in public places — are two examples of projects that seek to expand the scope of the dialogues taking place around poetry while still maintaining a value for stunning visual presentation. I’m particularly drawn to the idea of both kinds of broadsides — those which, by their small-scale production (often by hand), ensure that the poems printed on them will continue to be treasured as objects of quality and great cultural importance, and those which, by their widespread availability, ensure that poetry can continue to grow outside of itself, to evoke new conversations in unusual places so that the consumption of beautiful art need not be reserved for those with money. Has your poetry ever been made into a broadside? Do you create broadsides? We’d love to hear from you! Please leave a comment to tell us about your experiences. As we wrap up the first part of our March theme, we’d like to offer you the following list of resources, which we hope will inspire you to delve deeper into the world of ekphrastic poetry. Part of the”Cultural Encounters: Friday Nights at the de Young” program hosted by the San Francisco’s de Young Museum. This month, the series is being hosted by Michael Ondaatje and will take place on March 19th. (See our Community Calendar for more details). Student artists from the WritersCorps San Francisco program present their work at a number of gallery venues around the city. March’s installment will take place at the Contemporary Jewish Museum. A truly useful collection of over 700,000 archival images — you’ll find book illustrations, art prints, photographs, postcards, images from magazines and newspapers, and more. We did a simple search for “chinatown” and came up with 256 really interesting hits. 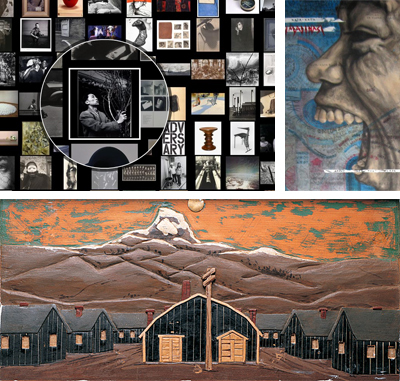 If you look at nothing else in this post, you must check out this super-cool art browsing tool. The SF Museum of Modern Art has made it possible for you to dynamically explore 4,775 individual images from their collection simply by zooming, dragging, and clicking. Browsing through the wall of images as it expands and contracts in response to your mouse-clicks is a completely mesmerizing experience, not to mention a great free way to familiarize yourself with the museum’s collection. Adobe Flash Player is required to view the site. Curated by Marne Kilates, this online journal focuses on ekphrastic poetry, presenting poems artfully alongside the images which inspired them. Of note: the most recent issue includes work by Luisa Igloria, whose thoughts on ekphrasis were featured in a recent post of ours. Ekphrasis, says its web site, “is a poetry journal looking for well-crafted poems, the main content of which addresses individual works from any artistic genre . . . Acceptable ekphrastic verse transcends mere description: it stands as transformative critical statement, an original gloss on the individual art piece it addresses.” Ekphrasis is available by subscription. Submissions are accepted via postal mail. Places permeate my writing since you may say that I am someone of travels — in exile and displacement, so-called. I’ve traveled, yes, and at times, without a choice, but I am never a tourist. Pierre Nora sees places as sites of memories; I see places as moments and years. I thought that writing about places as memories risks falling into the trap of flat sentimentalism, or a re-invention of the past. Unlike most artists in exile who eschew geographical precision, I look towards the porosity of borders — both physical and temporal — for inspiration. Otherwise, places are no different from identities, and any kind of identity will never fail to imprison souls. To read the rest of the interview, click here. Also worth checking out is the latest issue of Cerise Press, a magazine that Sze-Lorrain creates and edits with Karen Rigby and Sally Molini. It’s an intriguing space that beautifully mixes translation, art, and lyric — and is well worth the read.